At this point, you’re probably aware of the importance of including images in your social media posts. You know that images in Tweets can boost engagement by up to 313%, and that it’s no different on Facebook either, where posts with images get 130% more engagement. But now the question probably becomes, “How can I create those images quickly AND affordably?” And that’s what this post is about: the best tools to create images for social media to improve your social media marketing without eating up all your time. 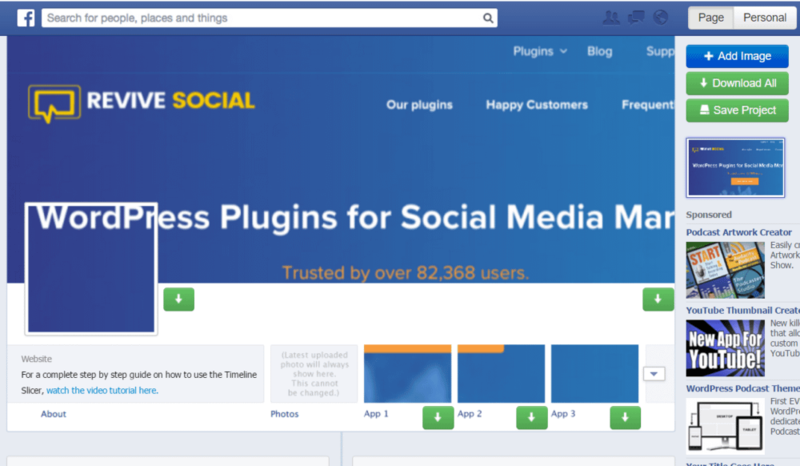 These tools can help you quickly create quote images, infographics, Pinterest covers, and anything else you need to be successful on social media. 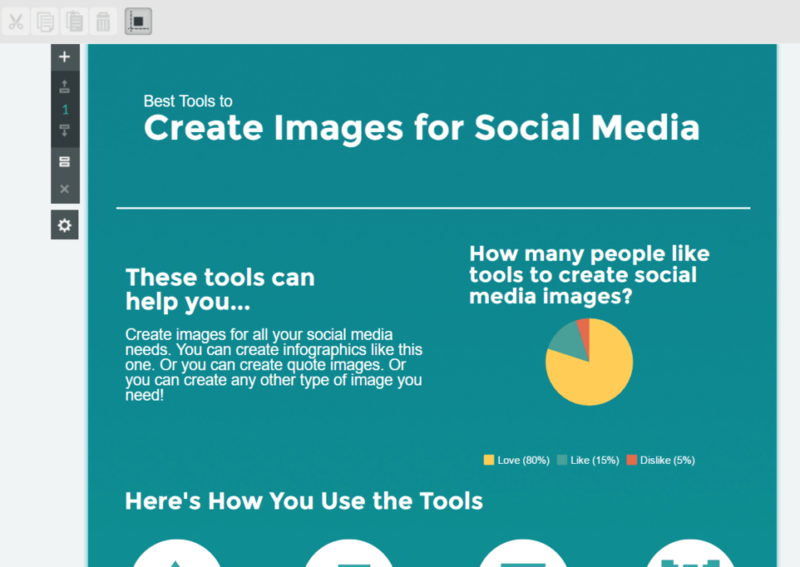 If that sounds like it might make your life a whole lot easier, keep reading for the full list of tools to create images for social media. In this first list, I’ll highlight some of the best all-purpose social media image creators. With these tools, you can create pretty much any type of image. BUT, like most jacks of all trades, the process isn’t always as streamlined as it could be. That’s why in the next sections I’ll show you the best tools to use if you need to create specific images like infographics, quote images, and more. Canva is number one on this list because it’s definitely the most versatile tool to create images for social media. Many of the other tools are specialized for one type of image, while Canva can cover pretty much anything. But, because it’s not specialized, some times it can take longer than it needs to create some types of images vs the others. 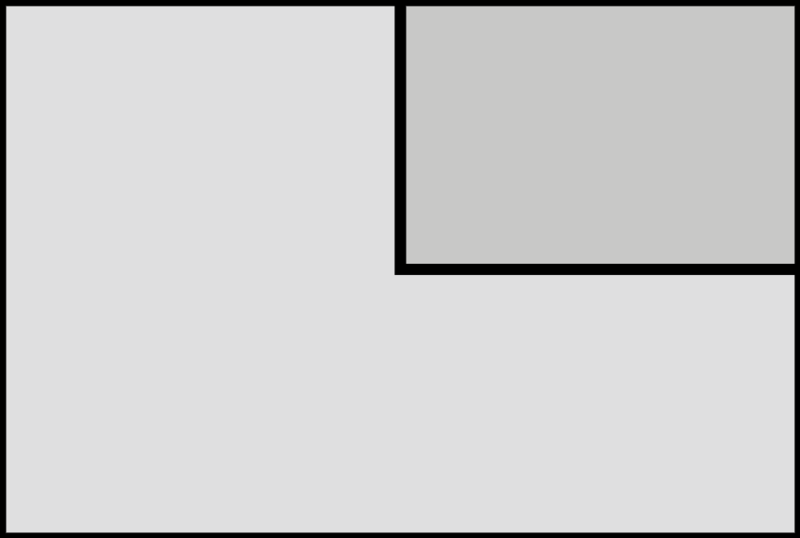 Canva has preset image sizes for Twitter, Facebook, and even Pinterest, which is important because Pinterest has unique image dimensions. 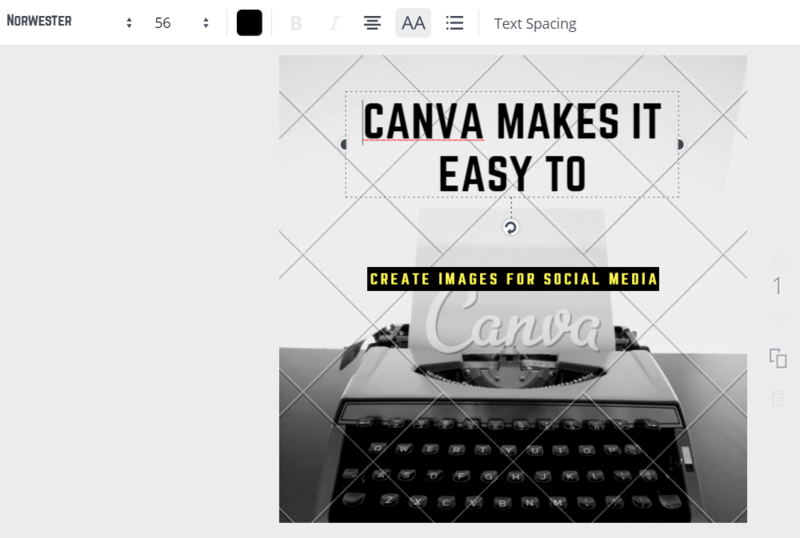 Canva is a great first stop when you need to create a general image for social media, but if you want to create something like an infographic or a basic quote image, there are better tools that can do those tasks faster. With Pixlr, think “Photoshop as a web app”. It’s not as user-friendly as the other tools on this list, but it does give you some powerful editing options. Pixlr works with layers and effects, so if you need something to create images for social media that are especially complex, it’s the web app for you. Just don’t expect to crank out finished images in under a minute like some of the other tools. Stencil is a social media image creator targeted specifically towards marketers and bloggers. As such, their templates lean towards those uses. All you have to do is pick or upload a background and add your text/design elements onto it. Then you’re ready to share. Piktochart is an infographic creator tool that makes it easy to create beautiful infographics and reports. Start with a template, plug in your data and images, then share the finished product on social media. Even if you don’t want to create a full infographic, you can still use charts and graphs to enhance your social media posts. Infogr.am is a helpful tool that lets you represent your data with over 35 different chart types, which can be a great way to create images for social media. Easel.ly functions similarly to Piktochart but with a whole different set of infographic templates. So if you can’t find something you like on Piktochart, give easel.ly a try! 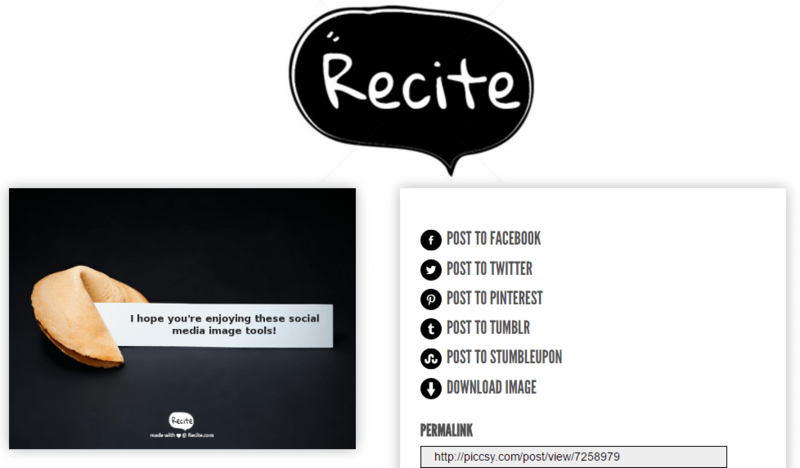 Recite is one of the fastest tools you can use to create quote images. All you need to do is enter your text, choose one of the live previews, and click Create. Then, you can instantly share your new quote image on social media. It only takes about 15 seconds – seriously! Pablo from Buffer is another quick option to create images for social media – quote images in particular. Though it lacks the variety of backgrounds offered by Recite, it’s just as quick and simple to use. 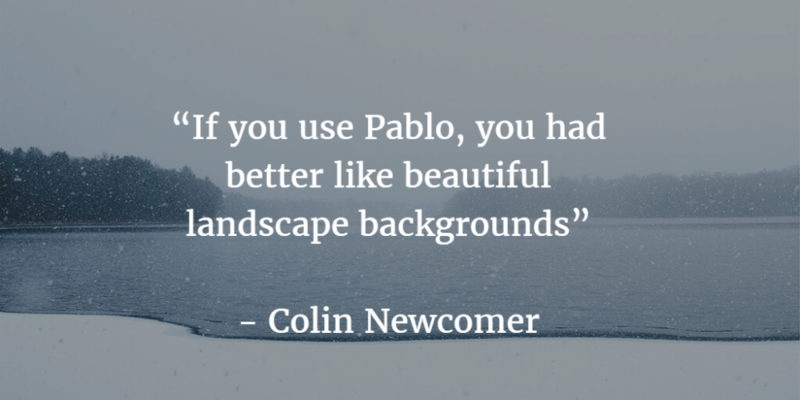 Just know that with Pablo, you’ll be relying on beautiful stock image backgrounds rather than styled designs. Formerly known as Pinstamatic, VizzBuzz has maintained its focus on Pinterest despite the rebranding. VizzBuzz helps you quickly create quote/text images. Once you create an image (which takes seconds), you can add a description and pin it directly from the VizzBuzz interface. If you’re focused on Pinterest marketing, this is definitely the tool for you. VizzBuzz now also offers similar functionality for Twitter, too. Just write your Tweet and share directly from VizzBuzz. If you want to share annotated screenshots, Jing is a helpful tool for Windows users. It lets you use mouse clicks or hotkeys to create a custom screenshot. You can then annotate that screenshot with arrows, text, or boxes. Skitch functions almost identically to Jing. But…it’s exclusive to Mac OS. Mac users can enjoy Skitch’s great design elements, but Windows users will need to stick to Jing. More and more brands are incorporating memes into their visual content marketing. If you want a quick way to create images for social media, consider memes. They definitely aren’t for every brand, but if you have a light and humorous brand position, you can use memes to generate engagement on social media. One of the best meme generators is the aptly named Meme Generator. Just pick your meme, enter your upper and lower text, and share on social media. If you want to take a screenshot of a full website, say to share on Pinterest, you can use a tool called Page2Images to quickly convert the entire website to an image. 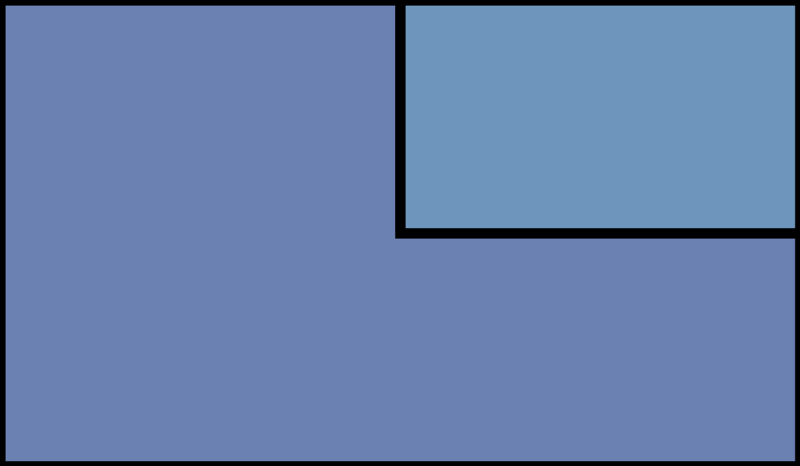 This method is superior to using Jing or Skitch because it will capture below-the-fold content too. Just enter any URL and Page2Images will spit it back as a downloadable image. If you already have some finished images, a nice way to display them together is to create a collage. Collages are especially popular on Instagram, but can work on any social network. Fotor Collage Maker lets you quickly upload your images, choose from a variety of collage templates, and output finished collages. If you’re struggling to find the perfect images for your Facebook profile picture and cover photo, Timeline Slicer offers a visual way to crop existing images to find the perfect dimensions. Just upload them into the tool’s Facebook-like interface, drag them around until you’re happy, and export perfectly sized images for your Facebook page. PlaceIt helps you quickly generate demos of your website or product being used in real life. For example, you could take a website screenshot with Page2Images, and then put that screenshot on someone’s Macbook screen with PlaceIt. You’ll likely want to use these images mostly on Facebook or Twitter, though you can technically use them for any social network…I just doubt someone will want to pin the image! Landscape is a handy web app for resizing your images to fit every single social network’s recommended dimensions. All you need to do is upload a photo, choose the social networks, and the app will help you resize and crop your images to be the perfect size for each specific social network. Landscape is great for taking one finished image and using it for all your social media accounts. No need to recreate the same image over and over! Personally, I use a combination of all these tools. Canva is typically my first stop, but if I need to create something specific, I’ll dip into one of the infographic or quote makers. And finally, no matter which tool you use to create images, the enhancement tools I listed at the end always come in handy. What do you use to create images for social media? Feel free to share in the comments. Nice post so i read this post if i like it you’re probably aware of the importance of including images in your social media posts.And that’s what this post is about: the best tools to create images for social media to improve your social media marketing without eating up all your time. These are great! Thanks. Any photo resource recommendations? What do you think of the new one, reshot.com? Hi, I think you should consider this circular border maker by TimelineCoverBanner: https://www.timelinecoverbanner.com/circular-profile-picture/ It has interesting point where user can create a vibrant circular border around profile picture. The same effect when user create an instagram live video, their profile will be highlighted with the border. And also for quotes picture, We have https://quotescover.com. It have tons of quotetion and robust application. The downside, it still use flash.